When can memory loss set in? A healthy lifestyle can help! How has Memo-Rise helped others? How do I use Memo-Rise? Do you find yourself becoming more and more forgetful as you get older? Does your memory regularly fail you? Are you forever having to write things down? As we grow older, we sometimes begin to notice that our memories are not as good as they used to be. Fall off of cognitive functioning, including memory, can begin from as young as the mid-thirties and is greatly affected by genetic makeup, stress and other health-related factors such as diet, exercise and lifestyle. It has also been discovered that the more active we are mentally, the better our minds work and of course this applies to all age groups! Keep your mind functioning at its peak by eating lots of fresh fruit and vegetables and whole grain foods, getting plenty of fresh air and sunshine and exercising regularly. Avoid smoking, excessive alcohol intake and other drugs. Keep your mind as active as possible - enjoy life to its fullest and find things to laugh about every day! Now there is a natural remedy that has been scientifically shown to improve memory loss linked to aging and which can lead to improved cognitive functioning and a 'sharper' mind. 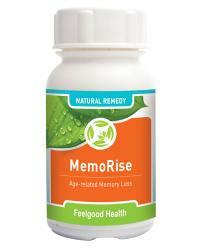 Memo-Rise Capsules contain 100% pure imported Ginkgo Biloba, Rosemary and Sage and are recommended for mature minds to improve memory and blood flow to the brain and as a general tonic. The natural ingredients of Memo-Rise have been clinically shown to reduce the symptoms and slow the process of Alzheimer's Disease. Memo-Rise is a safe and effective all-herbal supplement which can assist you in your goal of retaining optimal mental functioning. Memo-Rise contains herbs especially selected by a Clinical Psychologist to improve blood flow and oxygen supply to the brain and to tone and strengthen the central nervous system. Memo-Rise is also a general tonic to improve vitality and overall well-being and has a beneficial effect on the cardio-vascular system. Many of the herbs especially selected for Memo-Rise are backed by scientific research as well as traditional and historical evidence. "I was very worried that I was developing early signs of Alzheimers which had affected my mother so badly. I had to write everything down and the words were always at the tip of my tongue. I am glad to say that after taking Memo-Rise for 5 weeks these symptoms have very much improved. I also find that I have more energy - thank you!" Ginkgo Biloba is a powerful herb from the Far East and has been grown in temple gardens for millions of years. Its medicinal properties have only been discovered by the West during the last 20 years, where clinical studies have indicated its effectiveness in restoring the functioning of the circulatory system and improving blood flow to the brain. Active ingredients include flavone glycosides (including ginkgolide), bioflavins, sitosterol, lactones and anthocyanin. Rosmarinus Officinalis is a herb which originated in the Mediterranean and is regarded in folklore as a symbol of remembrance, for good reason. It is an excellent tonic and system energizer and has a therapeutic effect on the circulatory system, also improving blood flow to the brain. Directions: Take two capsules two times daily after food or as prescribed. Caution: Safety during pregnancy has not yet been established. Not recommended for people with bleeding disorders. Do not use together with anticoagulant medication. Also not recommended for people with epilepsy or a history of seizures. With regular use of Memo-Rise, results should be noted within 3 – 6 weeks. It is important that it be taken regularly in order to enhance the overall brain tonic effect. Over time, Memo-Rise should help alleviate the standard absentminded problems commonly experienced with normal aging and support the normal brain functions of memory, recognition, and abstract thinking. One bottle of Memo-Rise contains 60 capsules and will last 15 days (see the Buy 3 Get 1 FREE special offer). Prime Memory pack: Herbal memory aid plus brain health tonic!